My present modelling task is to work on three Proto 2000 SD9 SP black widow shells, to represent brand-new locomotives 4348, 4349 and 4350, as seen at San Luis Obispo in April 1954. On page 37 of Strapac's SD7/SD9 book, there's a snap by Rod Crossley of three SD9s at SLO, but only the number of 4348 is visible. It was only when I purchased Crossley's Chasing the SP in California 1954-56 that I saw, on page 45, another picture of the SD9 trio coming in to SLO on Train 920, with locomotives 4349 and 4350 visible. I plan to re-number them, replace the horns, install two barrel headlights (only the front ones to operate), move the "Southern Pacific" logos on the sides down to the louvres, and make the sunshades more prototypical. They will have Loksound decoders installed, using the Western Union custom early EMD download tweaked by Mike Ruby. Last edited by BrianMoore on Thu Oct 18, 2012 2:18 pm, edited 1 time in total. Me too, hoping for some pics , and seeing them in action at some point. Perhaps good to know is that Cannon&co finally ships the 36" radiator fans for the SD9 etc. Although it still says 'coming' on the main pages, once in their webshop you'll find them towards the bottom of the page in the fans section. They ship in packs of 4, and since you need 6 , you'll have spare, or 3 packs will do two loco's! Some problems have been encountered in removing the printed on "Southern Pacific" lettering on the side panels, without compromising the rest of the models' paint jobs, but we're getting there. Once they are off, some Microscale replacements will be put on, lower down across the louvres. SP decided that it was too costly to paint the words over the louvres, so raised them higher on subsequent SD9s. I'll eventually get around to the Cannon replacements, but this will be just doing enough to make them look reasonably accurate. It sounds like a great fun project Brian, I guess that must mean you soon own (or have owned) pretty much every SP incarnation of SD7/9 there was (except small variations)? Black Widows, tiger stripes, bloody nose, snow fighters, am I missing anything? 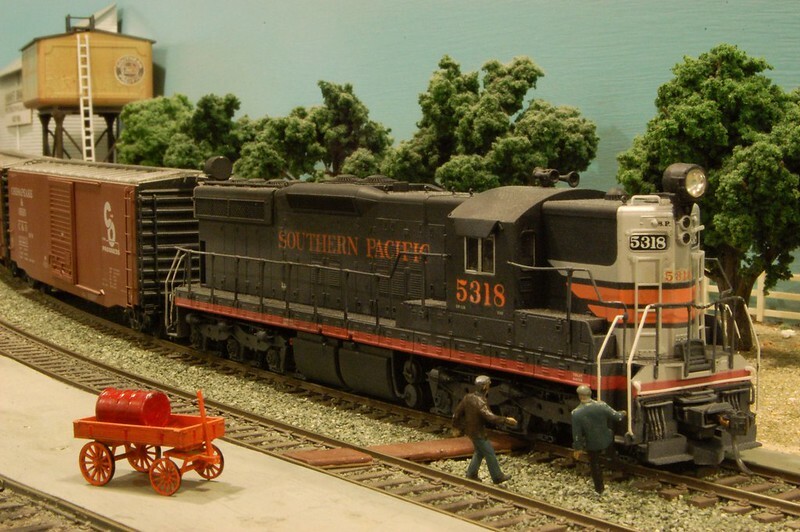 SP SD7 5318 was originally painted "black widow" but still retaining the original orange "Southern Pacific" on the sides and cab numbers, and I've done a model of that, as its from 1954. The one I've not needed is the short-lived "Halloween" scheme given to, amongst a few other SP locomotives (but no SD9) two SD7s for a short while in the late fifties - 5327 and 5333. It consisted of black all over, apart from an orange nose and rear. They were repainted standard scarlet and grey shortly thereafter. There were some minor variations of the scarlet and grey livery on SD7s and SD9s, but nothing hugely variant from the norm. Last edited by Gloriousnse on Thu Oct 25, 2012 10:16 pm, edited 1 time in total.